1. sched=”schedule-slug” tells the shortcode what schedule to display. 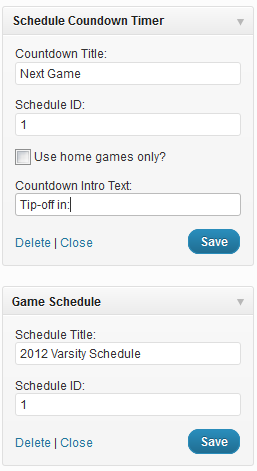 3. home_only=”true/false” tells the shortcode to countdown to home games only. Defaults to false (all games). The countdown timer WIDGET supports the same parameters along with a widget title. cdt_dtg_format=”custom” Note that this argument has to be paired with the following argument. custom_cdt_dtg_format= “any valid PHP date() format string” Note that this format should be a date+time format for when the game time is not T.B.D. cdt_date_format=”custom” Note that this argument has to be paired with the following argument. custom_cdt_date_format= “any valid PHP date() format string” Note that this format should be a date only format for when the game time is T.B.D.